A total of 83,130 pilgrims have visited the cave shrine in the south Kashmir Himalayas during this year's pilgrimage so far. 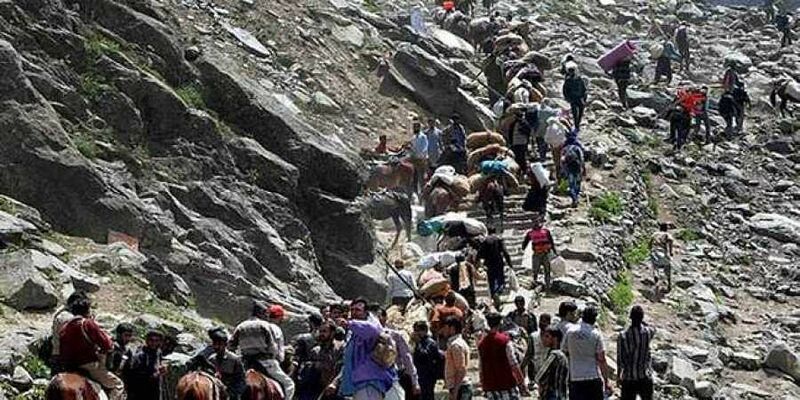 SRINAGAR: The Amarnath Yatra resumed on the Baltal route in central Kashmir's Ganderbal district today after remaining suspended for three days due to landslides and inclement weather. The annual pilgrimage resumed on the Baltal route this morning, an official spokesman said. He added that on the 10th day of the yatra, 10,107 pilgrims paid obeisance at the holy cave. The spokesman said on the directions of Jammu and Kashmir Governor N N Vohra, MI-17 helicopters of the Indian Air Force continued to operate today and evacuated the remaining 241 of the 567 pilgrims, who were stranded at Panjtarni. He added that to address the serious problems caused by landslides, particularly between Railpathri and Brarimarg, the critical spots were identified and preventive measures -- laying of wire mesh, lighting of the track, raising of breast walls -- were being undertaken on emergency basis to ensure the safety of the pilgrims, in addition to the deployment of rescue teams. The yatra had resumed on the Pahalgam route yesterday.